This article has been written by Tarek Mehio, head of Business Development at EuroVPS, and community manager at GrowthMentor. He recalls his experience with Feedier, explains how it fits into their current workflow and help them create better customer feedback surveys. Customer Success is one of the most important aspects of our business at EuroVPS. EuroVPS is a European Hosting Company providing reliable managed VPS hosting on the fastest and low ping servers in Europe. They launched in 2004 and count more than 2,000 clients as of today. With web hosting being one of the most commoditized segments of the online services sector, it’s extremely difficult for a company of our size to stand out. Our competitors are mainly focused on price, and we decided early on that trying to compete on price would be a losing battle. There’s always someone out there ready to sacrifice a little more quality in order to charge a little less money. In our opinion, this is a slippery slope that leads to disastrous outcomes for the end user. This is also why so many people are frustrated with their hosting companies and why so many people turn to managed hosting as a solution – it gives them time to focus on their business and drastically reduces the amount of work needed just to keep their servers online and running smoothly. That’s exactly where we positioned ourselves as a company. Managed services. We trained a full team of system administrators and have them ready 24/7/365 to handle any problem that can go wrong with a server. But also to help our clients out within minutes of an issue. It is, but it also means that our team ends up having hundreds of contact hours with our customers, which very much goes against the grain of the modern online business – where automation is king and the productization of every service is the holy grail. So we also realized early on that we needed to keep track of how we were doing with our customers. We need to make sure every customer experience is a good one; but we also need to learn quickly whenever a customer has a bad experience. Lastly, we want to make sure that since our customer support and user experience is our selling point that as many potential clients know about it as possible. To solve these problems we started requesting customer feedback after the resolution of every support ticket. Initially we were requesting long-form feedback but quickly realized that our customers were busy and the only time we got long form feedback was when customers were either extremely happy or extremely unhappy, which doesn’t give us a real indication of our performance. What areas were we excelling in? Was there something the client wished we could have done? We also needed to answer these questions in a quantifiable way so that our Cost Benefit Analysis could assess the impact of introducing a solution in, at least a relatively accurate way. Once we had decided on a survey structure that got us the information we needed, we set out using various tools to collect and harness that data. 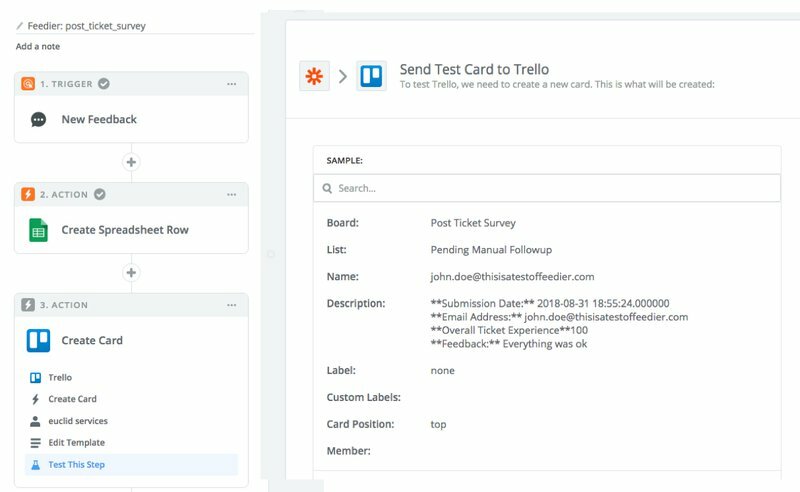 We built out integrations and created automatic task assignments so that our customer success team could follow up with clients who had given detailed feedback. We spent a lot of time making sure that all the data we collected would be put to good use. The ultimate goal was both to learn from our mistakes and get our successes recognized, shared by our clients to their audience and of course on valuable review sites and forums. This still sounds pretty good right? The biggest problem was a lack of engagement. We did get some more feedback, and negative feedback was (and still is) being put to good use and is being reviewed by our customer service team. However, when it came to good feedback and truly happy customers, most of the time that would be the end. We would follow up with our clients to start a conversation and pitch various opportunities to engage, but our conversion rate on getting forum shares or testimonials or third party reviews was pretty low. This was surprising because most of our feedback on customer satisfaction was (and still is) around 90%. When we came across Feedier one of the first thing we noticed is how much more engaging the interface is over other tools that we’ve used. The aspect of gamification and rewards integration makes the survey both visually appealing and fun to complete. Also, the survey allows you to build an interesting logic structure into the feedback Carrier, which is Feedier’s name for a survey. The platform enabled us to collect various satisfaction related data from a client first and then use that data to shape how the rest of the feedback survey would behave for that particular client. This gave us an interesting opportunity to add depth to the kinds of information we received. So beyond just finding out that a customer was unhappy, it allowed us in a somewhat quantifiable way to determine why there unhappy, and which areas we needed to focus on to improve the experience. The great thing is that we are able to do all of this without needing to go back and get clients to participate in a second follow up call etc. to gather this qualitative information. It’s all done from the moment they complete the survey. 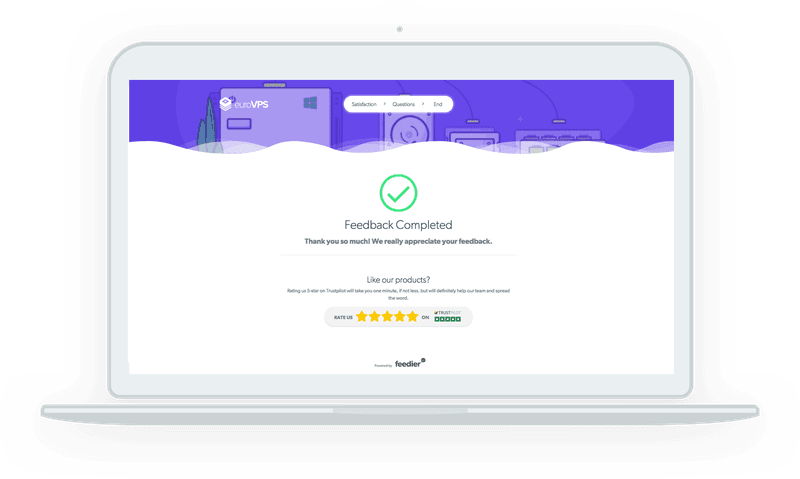 Finally, Feedier also solves one of the primary obstacles that we had with customers who left good feedback – a lack of conversions when it came to asking for online reviews from our happy customers. 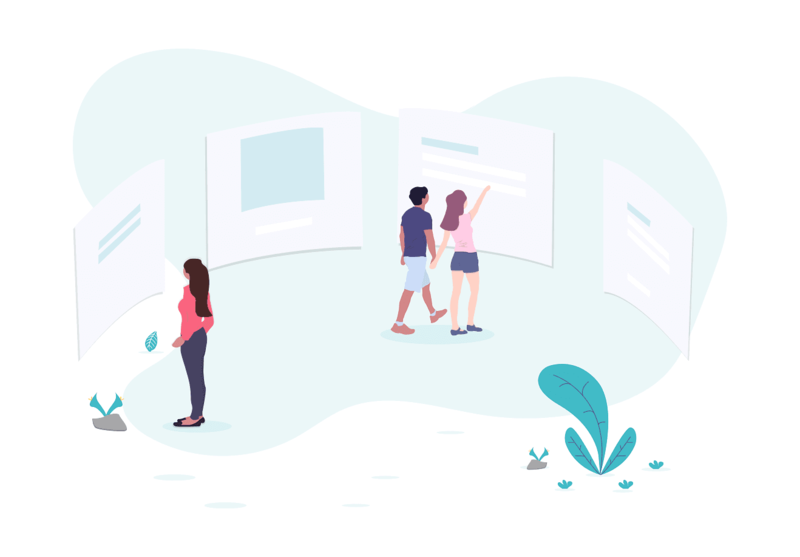 The ability to build engagements (such as review requests, or testimonials) directly into the feedback survey and attach them to rewards is an extremely valuable feature for overcoming that problem. It not only increases conversions but it intelligently gives our customer service team the time to focus on more complex issues and that ultimately has an even better impact on our performance. A key requirement for us was that we would be able to build Feedier seamlessly into our customer service toolkit. We use various tools like Drip, Slack, Google Sheets and Trello to help us track and manage our customer success workflow. Integrating Feedier with these tools was a piece of cake using Zapier. We were able to connect the data collected to our other tools without any issues. We were then able to fill our feedback database which our sales and marketing teams use to glean insights and simultaneously pump individual feedback responses into our project management tool. In our case, we are using Trello. Our customer success team is then able to follow up on tickets that warrant in individual response. 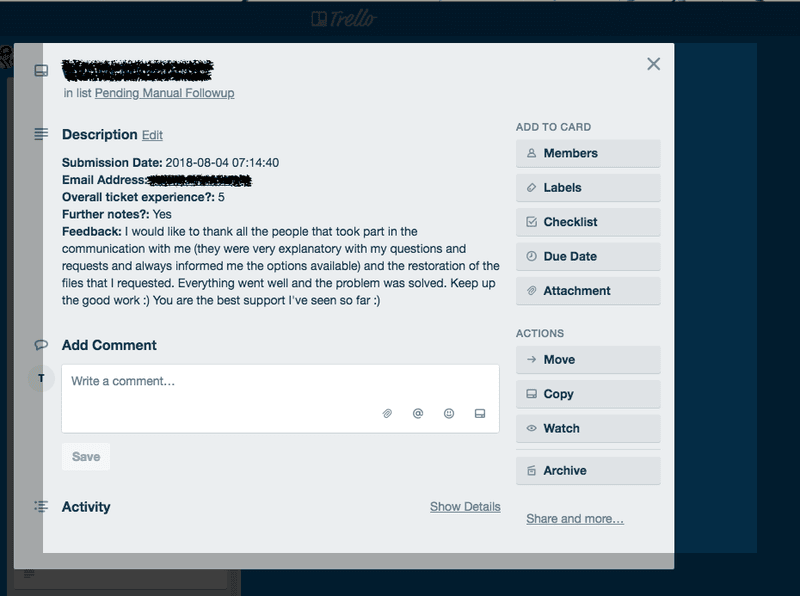 We rebuilt the entire Customer Success workflow to include the data collected from Feedier in under a day and went straight back to collecting useful, meaningful customer feedback. All in all, we find that Feedier gives a fresh and engaging way for our customers to let us know how we’re doing. It also gives us a trackable and quantifiable way to test for increased engagement with our customers and finding out how best to reward them for giving us good reviews or how best to help them when they’ve had a less than perfect experience with our customer support team. It’s a valuable tool for anyone looking to refresh the way they collect performance data from their customers and we’ll certainly be making good use of it at EuroVPS. whah this blog iis excellent i love studying your posts. hors as of late, yyet I never found any fascinating article like yours. Thanks Russ, appreciate the kind words!